Definition at line 1455 of file tcpcore.h. Definition at line 1560 of file tcpcore.h. Referenced by tcp_acceptq_added(), tcp_acceptq_is_full(), and tcp_acceptq_removed(). Definition at line 1612 of file tcpcore.h. Definition at line 1543 of file tcpcore.h. 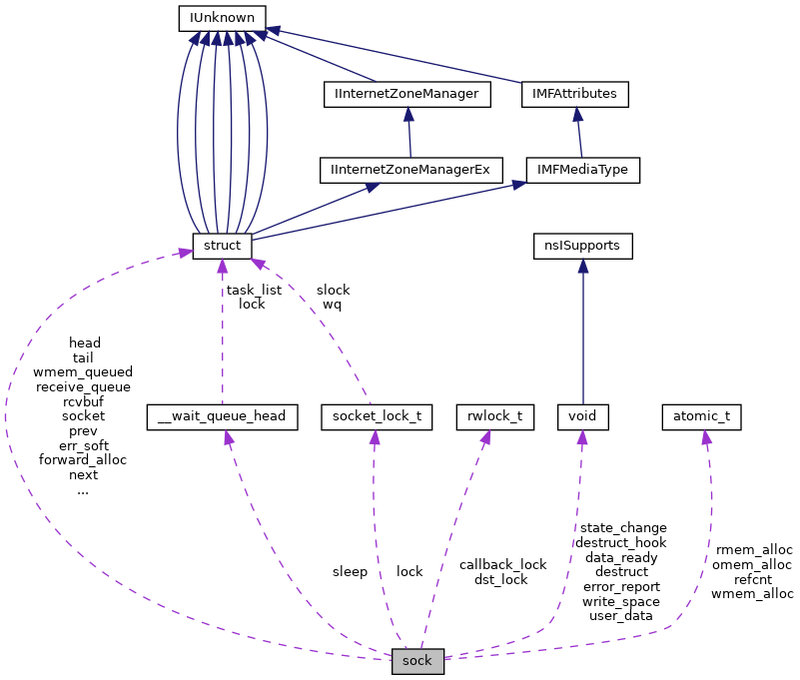 Referenced by tcp_acceptq_queue(), tcp_clear_xmit_timer(), tcp_current_mss(), tcp_free_skb(), tcp_initialize_rcv_mss(), tcp_prequeue(), tcp_reset_xmit_timer(), tcp_synq_added(), tcp_synq_drop(), tcp_synq_is_full(), tcp_synq_len(), tcp_synq_removed(), and tcp_synq_young(). Definition at line 1492 of file tcpcore.h. Definition at line 1644 of file tcpcore.h. Definition at line 1466 of file tcpcore.h. Definition at line 1467 of file tcpcore.h. Definition at line 1461 of file tcpcore.h. Definition at line 1499 of file tcpcore.h. Definition at line 1529 of file tcpcore.h. Definition at line 1457 of file tcpcore.h. Definition at line 1640 of file tcpcore.h. Definition at line 1508 of file tcpcore.h. Definition at line 1646 of file tcpcore.h. Definition at line 1580 of file tcpcore.h. Definition at line 1459 of file tcpcore.h. Definition at line 1482 of file tcpcore.h. Definition at line 1483 of file tcpcore.h. Definition at line 1556 of file tcpcore.h. Definition at line 1532 of file tcpcore.h. Definition at line 1642 of file tcpcore.h. Definition at line 1473 of file tcpcore.h. Definition at line 1490 of file tcpcore.h. Referenced by tcp_alloc_page(), tcp_charge_skb(), tcp_free_skb(), and tcp_mem_reclaim(). Definition at line 1517 of file tcpcore.h. Definition at line 1525 of file tcpcore.h. Definition at line 1515 of file tcpcore.h. Definition at line 1564 of file tcpcore.h. Definition at line 1478 of file tcpcore.h. Definition at line 1561 of file tcpcore.h. Definition at line 1464 of file tcpcore.h. Definition at line 1460 of file tcpcore.h. Definition at line 1488 of file tcpcore.h. Definition at line 1518 of file tcpcore.h. Definition at line 1465 of file tcpcore.h. Definition at line 1494 of file tcpcore.h. Definition at line 1562 of file tcpcore.h. Definition at line 1514 of file tcpcore.h. Definition at line 1534 of file tcpcore.h. Definition at line 1565 of file tcpcore.h. Definition at line 1458 of file tcpcore.h. Definition at line 1479 of file tcpcore.h. Referenced by tcp_fast_path_check(), tcp_full_space(), tcp_prequeue(), and tcp_space(). Definition at line 1567 of file tcpcore.h. Definition at line 1568 of file tcpcore.h. Definition at line 1509 of file tcpcore.h. Definition at line 1485 of file tcpcore.h. Definition at line 1476 of file tcpcore.h. Definition at line 1474 of file tcpcore.h. Definition at line 1484 of file tcpcore.h. Referenced by tcp_fast_path_check(), and tcp_space(). Definition at line 1513 of file tcpcore.h. Definition at line 1491 of file tcpcore.h. Definition at line 1475 of file tcpcore.h. Definition at line 1481 of file tcpcore.h. Definition at line 1493 of file tcpcore.h. Referenced by tcp_moderate_sndbuf(), and tcp_wspace(). Definition at line 1569 of file tcpcore.h. Definition at line 1633 of file tcpcore.h. Definition at line 1471 of file tcpcore.h. Definition at line 1630 of file tcpcore.h. Definition at line 1469 of file tcpcore.h. Definition at line 1639 of file tcpcore.h. Definition at line 1526 of file tcpcore.h. Definition at line 1629 of file tcpcore.h. Definition at line 1563 of file tcpcore.h. Definition at line 1510 of file tcpcore.h. Definition at line 1636 of file tcpcore.h. Definition at line 1511 of file tcpcore.h. Definition at line 1486 of file tcpcore.h. Definition at line 1489 of file tcpcore.h. Referenced by tcp_charge_skb(), tcp_free_skb(), tcp_min_write_space(), tcp_moderate_sndbuf(), and tcp_wspace(). Definition at line 1487 of file tcpcore.h. Definition at line 1641 of file tcpcore.h.